Members of the SALSA team are testing a gravity drill that has been developed to collect lakeshore sediment samples up to 20 feet deep. While baking Christmas cookies and Netflix bing for Christmas, a team of about 50 scientists, drillers, and support personnel were trying to cross nearly 4,000 feet of ice for the first time in human history, an Antarctic one to reach the subglacial lake. And people, they did it. On Friday, the Subglacial Antarctic Lakes Scientific Access (SALSA) team announced that they had reached Lake Mercer after melting through a huge frozen river with a high pressure hot water drill. The multi-year effort to develop the subglacial lake – one of about 400 scientists spotted across the Antarctic – provides a rare opportunity to study the biology and chemistry of the world's most highly isolated ecosystems. 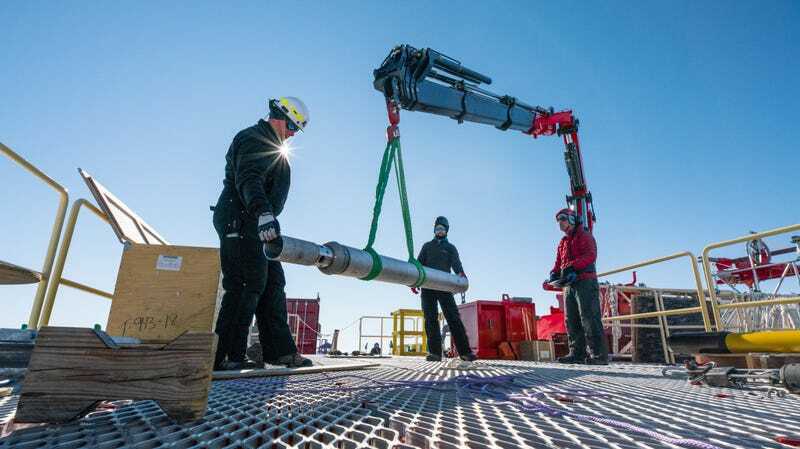 The only other subglacial lakes that humans have drilled in – near Lake Whillans (tested in 2013) – have shown that these extreme environments can facilitate diverse microbial life. Of course, scientists are curious what they will find in the icy waters of Lake Mercer. "We do not know what we will find," said John Priscu, biogeochemist at Montana State University and senior scientist at SALSA. told Earther via satellite phone from the SALSA drilling camp on the Whillans ice plain. "We're just learning, it's just the second time this has been done." Priscu and two other members of the SALSA science team, three drills and two marine engineers flew into the camp 650 miles away. The rest of the science team arrived with 8,000 pounds of cargo in tow the following day – some of the team's last supplies needed after ice tractors pulled out one million pounds of drilling equipment, makeshift laboratories and a warehouse structures last December. According to the latest SALSA blog post, on the evening of December 23, the team began drilling its main well, a well that serves as a well Water pumped back into the main hole after filtering and sterilizing was started one night earlier, Priscu said to Earther.) Things were obviously running smoothly, and the team reached the 54-square-kilometer lake the evening of Dece more than 26 holes up to one Depth of 1,084 meters. Now that the lake is open, the real fun has begun. The SALSA team uses a range of tools to study the lake, including a CTD (Conductivity, Temperature, Depth) probe that measures temperature and provides details on the structure of the water column, and a remote-controlled vehicle that performs similar measurements undertakes from the borehole and capture 4k video. Researchers will collect water and microbial DNA samples as well as ice from the top of the lake and sediment from below. While much of the initial analysis of these samples is done on-site, the samples and data are collected. This effort will likely keep scientists busy for many more years. In addition to exploring lifestyles that have not seen the sun for centuries, Mercer's subglacial lake provides an opportunity to better understand the local hydrology and nature of the lakes. This affects the flow of massive ice streams beneath which they are buried are. The study of Lake Mercer sediments could also help determine if, like Lake Whillans, it was closer to the sea, once a marine environment, and thus closes an important gap in our understanding of Antarctic history, Priscu said. Glaciologist and member of the SALSA team Matt Siegfried takes an Antarctic selfie. Downloading data from a long-term GPS site in the Whillans ice rink during the second week of the SALSA geophysics team in an unsupported satellite camp. A Sled Caravan brings equipment to the SALSA geophysics team during its third week in an unsupported camp. Glaciologist and member of SALSA team Matt Siegfried inspects a GPS station on Whillans Subglacial Lake. Baking chocolate-butterscotch oat-biscuits to ring the New Year in the SALSA drill camp. For Siegfried, who heads a four-headed geophysics team that spent the last 5 weeks in the region waiting  A lengthy GPS array and the installation of electromagnetic instruments for mapping subglacial water. The SALSA camp was "extraordinary". The team arrived last week when the drills pulled their hose out of the hole after they had penetrated the lagoon, wrote Siegfried via Satellite Internet. After a month alone camping on the ice, it felt like you were in a huge city. "We are knee-deep right [now] and are trying out the deepest standing body of water Humans have ever encountered under the Antarctic," says Siegfried. "[S] It takes some time to process the" most exciting part "[is]."